Center Stone(priced separately): Patented Emerald Crisscut white diamond available upon request or complete this engagement ring setting with one of our certified loose diamonds. Diamond Details: Round brilliant cut white diamonds of I color, SI1 clarity, weighing 1.40 carats total. Ring Details: Christopher Designs platinum with halo design and antique style caviar beading. 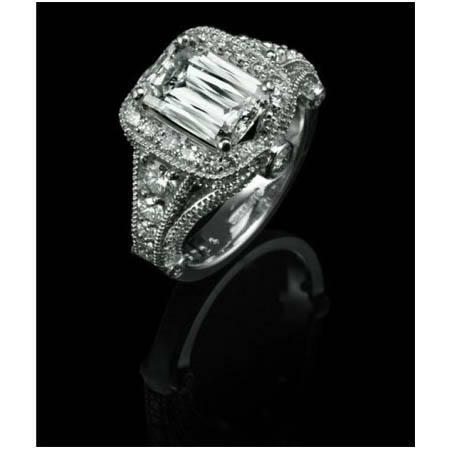 Accommodates a 2.50 carat emerald cut center stone. Measurements: Christopher design rings can be ordered in any finger size. Some sizes may be special ordered and take approx 4-6 weeks to deliver. This elegant Christopher design antique style platinum halo engagement ring setting contains 1 patented Emerald Crisscut white diamond at the center, weighing 2.58 carats, and round brilliant cut white diamonds of I color, SI1 clarity, weighing 1.40 carats total. Beautiful caviar beading, creates an antique style effect. Each Christopher Designs ring is hand made with diamonds carefully selected and cut to maximize the beauty of each individual piece. Pricing will vary on out of stock items. Please inquire on current pricing, availability and product specifics before ordering.